Runar Beyond used to be the mastermind behind Beyond The Morninglight, a strange band from Norway combining psychedelia à la Pink Floyd with gloomy new wave not unlike The Cure. With Blood Moon Hysteria, Runar tries to take his psychedelic side into a more metal sounding territory, with the first EP Crimson Sky released in mid-2016. Back then, the vocals retained that stoned quality from Beyond The Morninglight, giving it all a certain mood not unlike Norwegian avantgarde metal band Virus. The new EP My Sacrifice, coming a short two years later, has an overall harsher outlook. The opener and title track is a groovy rocking black’n’roll track with vocals that are no longer lamenting like a young Tom Warrior from Celtic Frost, but instead we get a guttural performance that is definitely more earthy than what Runar Beyond did before. The middle part of the song comes with a psychedelic guitar part, because we should not forget that Blood Moon Hysteria is still about creating a weird and trippy kind of extreme metal. Deception is more in the mood of the first EP, although the vocals are again more aggressive than they used to be on the debut. It’s on this piece where the mellotron is unpacked, to achieve that special Seventies prog feeling. The EP’s second half begins with Towards The Abyss, which surprises as a thoroughbred black metal track of the most primitive kind. I would not have expected this kind of song on this kind of EP, but then it’s Norway where primeval black metal was coined, so that it is probably Runar’s cultural heritage that made him do this. The EP ends with Deception, Part 2, sounding quite alike to its Part 1, to be sincere. And when all is said and done, I must admit that I liked the debut better. 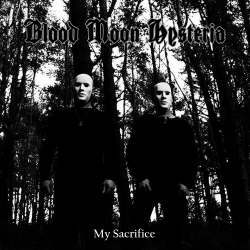 I understand Blood Moon Hysteria’s need to distance itself from Beyond The Morninglight, because they are two different entities, but My Sacrifice somehow gave up on what made this band so fascinating in the first place. It’s still a good enough endeavour, and many bands would be happy to come up with something so tight and yet so venturing, but as Runar Beyond has shown that he can do better, I can only hope that the next release will somehow combine to magic of the debut with the grittiness of the follow-up.